More than 86 per cent of survey respondents expect to enjoy a 2019 falling somewhere between ‘OK’ and ‘Extremely Good’. According to findings from the Wet Leisure Industry Survey, released earlier this year, the industry is planning on another strong year despite political and economic uncertainty.If we ever doubted we were like an industry of ice-cream sellers, 62.9 per cent said the weather would be the biggest influence on their business year on year. Businesses of between one and five employees make up 60 per cent of the respondents. Pools returned to the top of the workflow charts at 82.7 per cent, edging out spas at 78.2 per cent. Once again the Survey saw growth in the purely commercial sector, up from 2 per cent in previous years to four per cent last year and 4.6 per cent this year. 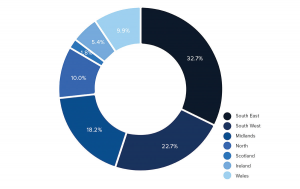 The South East has always been the largest region in the industry but its relative size has diminished over time, from 40 per cent of the 2011 sample to 33 per cent of this year’s. The North has shown consistent growth although this year’s figures show that to have fallen back a little. Wales has grown from a steady 5 per cent of the sample over the years, to 10 per cent of 2018 responses. Showroom sales dipped to an all-time low of 45 per cent, following a trend that has been visible since the survey began. Service and repairs continues to be the dominant activity in the industry as it has been since 2013 when it overtook installation. The number of businesses involved in the service and maintenance of spas in the holiday let sector is growing and growing. Although HSG282 provides guidelines for the work, it’s clear that most spa owners see the benefit of a spa professional maintaining the water quality.Saving energy and improving existing installations top the market trends chart. Recommendations by word-of-mouth were by far the most popular form of marketing.